Wholesale Trader of a wide range of products which include diffraction gratings 15000 lines uk. With a rich industry experience, we are engaged in supplying of a superior quality range of Diffraction Gratings. These are optical component with a periodic structure used in monochromators and spectrometers. The offered products work on the principle of splitting and diffraction of light into several beams. With this, gratings act as the dispersive element. 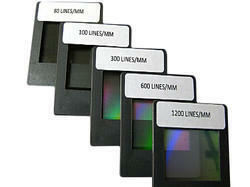 Looking for Diffraction Gratings ?